Rustic and farmhouse style is an all-time favorite when it comes to decoration. Rustic decor is filled with character, is inviting, cozy and timeless. It’s like if every piece is filled with history and has something to tell. The popularity of this style could be relate with its versatility: there’s more than a couple of guidelines to follow, rustic style can be infused with your own twist. This has make it move from lodges and cabins to all kind of locations, rustic decor now belongs to more contemporary residences. But as rustic decor is taking more spaces, there are a few things that has to change in order to fit in this popular aesthetic. Ceiling fans aren’t the exception, taken mostly for its functional purposing, ceiling fans are now an extra eye-catching piece of decor that can mix seamlessly on the whole decoration: dark woods, rustic finishes and antique-looking designs are part of the farmhouse and rustic outdoor ceiling fans. If you are looking for a gorgeous but functional ceiling fan that can complement your rustic home, don’t worry: we’ve make all the hard work and found a nice selection of the best rustic lodge ceiling fans on the market. Also, we’ll give you some tips and pieces of advice to make you an expert on the area. – Distressed finishes. If it looks shiny and sleek, leave it behind. Rustic style is raw and natural. – Simple lines. Not too much curves, intricate patterns or complicate shapes. It must be honest, uncomplicated, relaxing and cozy. – Neutral, warm, natural colors. Not neon, not too bold. Stir away from primary colors or modern combinations. – Rough-edged wood. Stay away from shiny and fake looking wood. You need the veins, distressed finish, grain and knots. – Galvanized steel, forged iron. – Think about natural colors: brown, gray, beige, tan, deep green, among others. As rustic style looks for natural and simple lines and designs, it could seem difficult to find a ceiling fan, such a modern piece and necessary piece, within those stylistic requirements. However, you’ll be surprised that designers and manufacturers have been providing some options that could fit perfectly in your color and material scheme. Rustic outdoor ceiling fans offers some advantages that can improve your life style and has become a popular fixture in most home. But think outside the box: more than just a functional element, a ceiling fan can become an important piece of decor that can provide character and work as a cohesive element on interior and exteriors. A ceiling fan has a prominent position in the middle of a room so it’s important to take it as one of the most decisive decorative pieces. It could seem almost impossible to make it fit in your shabby chic-inspired room, but if you pay attention to details like color, material and finishing, you’ll be able to find the perfect rustic outdoor ceiling fans. Try to match your ceiling fan with your floors: Hardwood floors can be paired with wood blades; think about colors: whites, browns, darker woods and dark finishes. Also, for vintage rustic, you can try to find a particular time aesthetic. Light fixtures are a nice way to add character or define a style, it could complement or transform the room. Don’t be so tight, try to play and mix styles, materials and finishes. Have fun and remember: there aren’t strict rules, your rustic style is yours to find and build. 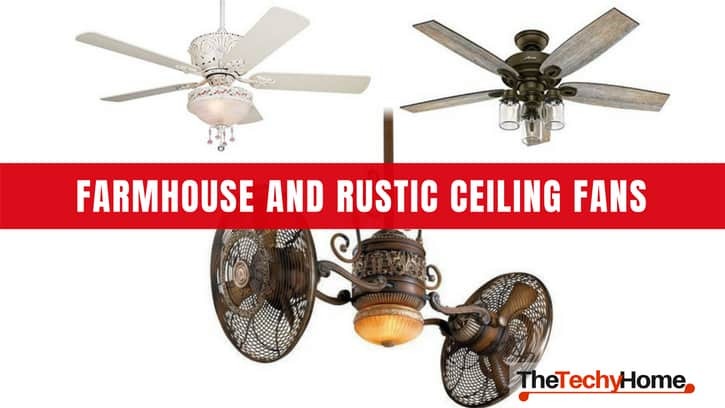 Check our well-curated selection, we’re sure that you’ll find the rustic ceiling fan that you are looking for. Size: you need to know how big is your room in order to pick the right fan. Remember that the cooling effect of your fan will be decreasing 2 feet from the blades, so take those measurements twice. The smallest fan size is 24 to 36”, for 6×6′ rooms. The biggest is 72 to 96”, ideal for those rooms larger than 15×15′. If your room is in the middle, 12×12′, you could pick a 49 to 56” fan. Ceiling height: your new ceiling fan must be installed at least 7 feet from the floor. It’s a safety issue, but also this guarantees the best performance. You’ll need to measure your ceiling height and if it’s too high, you’ll need a long rod to make the blades lower and if it’s too low, you’ll need a hugger or flush mount fan. Airflow: this makes reference to the amount of air displaced for the fan when working. Measured in CFM, it says if the fan is going to be big enough to cover all the space. Look for CFM higher than 4000 to 5000 for the best performance. Energy efficiency: the motor tells all about energy efficiency. Look for DC motors or energy Star-rated ones, because its construction/system is optimized to offer the best performance for the least energy. Look for a rustic outdoor ceiling fans that can work better for less energy. 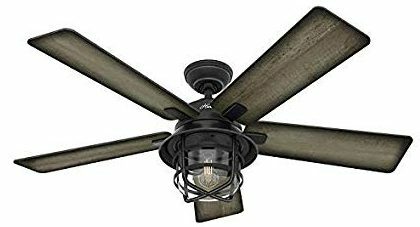 Number of blades: although this isn’t that relevant when it comes to proper function, you must be aware that the more blades the ceiling fan have, the quieter will be. Windmill ceiling fans, that are prone to have more than 10 blades, aren’t more powerful or efficient than those ones with just 2 blades; however, windmill ceiling fans are quieter and can move a bigger amount of air, making them ideal for high or vaulted ceilings and big open rooms. Also, they can be the best rustic outdoor ceiling fans. Control: there are three common types of controls: pull chains, wall mounted or remote controls. The ideal ones depends on your needs, room distribution, ceiling height and other particular details. For bedrooms and high ceilings, handheld remotes are the best options. After reading hundreds of opinions and reviews, studying materials, design and finishes we’ve come to this nice selection. 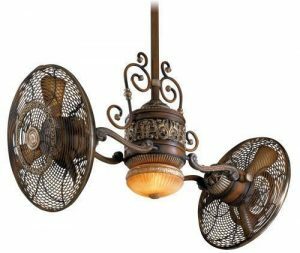 The Casa Deville Antique ceiling fan is made to impress your guest with its hand rubbed antique white motor. It has a blade span of 52 inches, perfect for medium sized rooms, with low or tall ceilings because it’s dual mountable. There’s charm and style on this fan. Could be perfect in a shabby chic ensemble with its beads and fabric bands and its off-white color. But there’s more than pretty style and nice looks: its powerful motor offers 3 speed and reversible function. This gorgeous fan has a pull chain control, but you could buy a remote control separately. It’s buyers couldn’t be happier with their purchase: they say it looks elegant, its distressed looks goes perfectly with their rustic-decorated places. It runs quietly, it’s powerful and worthwhile. A must for those looking for a nice antique looking fan. Primitive country is all about crude, simple and unrefined pieces. A primitive country furniture or ceiling fan must look hand made and old enough to be considered an antique. 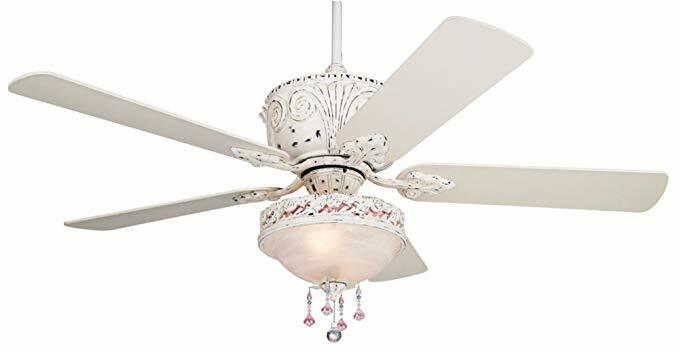 It’s kind of difficult to find a hand-made primitive looking ceiling fan but you can find a middle point by looking for a piece with a simple design and antique feeling, like this Warehouse of Tiffany CFL-8205 ceiling fan. Its 5 blades are made of dark-wood looking material, motor with a oil rubbed bronze finish; but what makes the big difference and let it fit in the primitive category is the light kit. A seeded glass bowl with 3 mini-candelabra lamp that looks like candles gives this antique rustic aura. The blade span is 52 inches, ideal for medium sized rooms. The powerful motor gives 3 speeds plus reverse mode and can get 1000 RPM and 2900 CFM in its lowest speed, and 1700 RPM and 4900 CFM in its highest. Controlled by a nice remote control, has a dimmable light and 3 speeds. If we were going to try to define french country in a couple of words, those could be elegant simplicity. French country style tries to create a warm, elegant and relaxed atmosphere. Neutral and warm colors, flowing lines, natural materials and sophisticated looks are part of this gorgeous style that integrates beauty and function. The ceiling fan that can accomplish this delicious array of stylistic requirements is the Vaxcel F0006 French Country Ceiling Fan. Warm- colored blades are the perfect pair to a three-light ensemble, decorated with Tiffany-looking shades. This ceiling fan can bring a cozy lightning and feeling to any room. Its size is 52”, a good motor with 3 speeds and a 4915 CFM and a life-time warranty on the motor, it’s an excellent addition to your decor. Western decoration is one of the most recognized rustic-styles. The ranch, cowboy, native American aesthetics are dormant in the collective unconscious and its related to some distinctive elements: earth tones, warm colors, wood, patterns, antlers, plaid, leather, hide, metal accents and more. It’s kinda of rough but cozy and warm at the same time. The Westinghouse Brentford will look perfectly integrated in that kind of decoration. This western ceiling fan is able to provide a neutral walnut finish to harmonize the room. Combined with a light kit with a lantern-style, the candelabra sparkles elegantly and offers some dimmed sophistication to this country decor. Its 52 inches blades will be enough to cool down a 360 sq ft room. Offers a quiet performance, 3 speeds, an airflow of 5062 CFM and a lifetime warranty on motor. Sometimes what your rustic decor needs is an antique. But let’s face it: we won’t find a secure and authentic antique ceiling fan, so we have to find a good antique reproduction. One of the best brands that offers nice antique-looking ceiling fans is Minka Aire. The Traditional Gyro is a twin turbo fan, made of belcaro walnut and will be the best addition to any rustic decor in need of some historic-looking piece. It has a 42” construction, suitable for medium rooms. Crafted with dual three bladed 17” turbofan heads, would look regal in high ceilings. Rotates in both directions, has 3 speeds and offers a 5050 CFM. This beautiful ceiling fan combines functions and look, will become the center piece of your room. Farmhouse Style is about practicality, charm and sophistication. Nothing can look like bought in the same store but has to have some history while looking cozy, relaxing and savvy. It ask for a balance between old and new, must be clean but warm and natural. Reclaimed wood, vintage furniture, wicker and weathered finishes can give the right atmosphere to this style. However, how does a farmhouse style fan looks like? The answer is simple: the Savoy House 52-840-5CN-196 Alsace made in reclaimed wood is the best option. The fan size is 52”, so is suitable for a 360 sq ft room. Inspired by the wine barrels in french vineyards, has riveted iron details and offers 3 speeds, an airflow of 5877 CFM and is operated by remote control. We are sure that this ceiling fan would fit perfect in your farmhouse style room. Mid-century marks a huge milestone in all design-related. Those pastel color schemes, Scandinavian and retro-futuristic aesthetic made a huge impact as it’s a legacy from a positive decade for America. All was about leisure, comfort, space exploration, progress, science and technology. It was innovative and original, traditional but made with new materials. There are two approach to mid-century aesthetic: the mid-century modern and the traditional one. 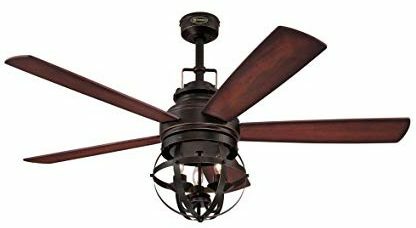 For the mid-century modern, the best ceiling fan is the Minka Aire F844-DK, made in distressed Koa finish. Its lines are elegant, modern, but has that retro futuristic vibe. For the traditional inclined, the Casa Vestige Antique Bronze is ideal, with that caged look, 3 metal blades and integrated LED downligth. A rustic or country victorian décor ask for cluttered but elegant and elaborate look. Lush and luxurious fabrics and finishes, details, flowers, lace, deep colors and rich patterns. Victorian style offers picturesque and idyllic images of rustic homes, countryside and seaside. Think about that luxury and elegance proper of victorian style, but with an airy feel. In rustic Victorian are the small details what brings together all the look. 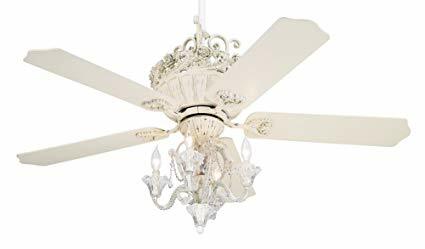 This nice chandelier ceiling fan from Warehouse of Tiffany can became the central piece of your decoration. Made in crystal, this fan has a blade span of 52 inches. Finished in bronze, crystal and real wood blades, has 3 speeds and 4 lights. The powerful motor can offer 1000 RPM at 2600 CFM at the highest speed. This gorgeous fan would look stunning in the middle of your victorian room. Shabby chic decoration tries to recreate the simplicity of country decor with the charm of stylish and elegant pieces. It’s incorporating dull and stylish, old and new. A shabby chic object must look worn out but elegant. Whites, natural finishes, pastels and flowers are common elements on this popular style. In fact, an all-white color scheme peppered with some color could be a great palette for any shabby chic room. 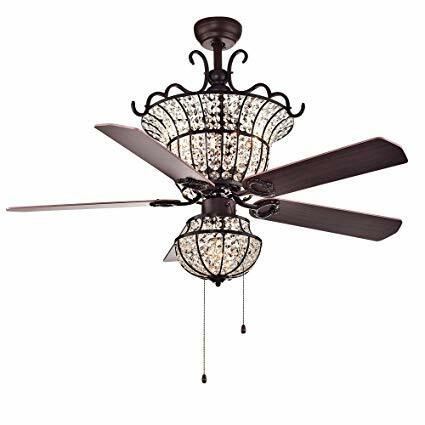 Chandeliers are the preferred light fixtures and could be even more functional if it’s paired with a nice ceiling fan, like this 52” Casa Chic Ceiling fan with a candelabra 4 light kit. Rubbed white finish and crystal bead accents makes an excellent addition to your shabby chic decoration. Pull-cord operated, has 3 speeds and reverse function. It’s gorgeous, elegant, simple and sophisticated. Mason jars are a staple in every home. They’re versatile, fun and functional and can leave the kitchen to become a decorative element with some creativity: flower vases, glasses, plant pots, and more. Mason jars have an special spot in rustic decoration, nothing looks more honest, simple and natural than a mason jar. Hunter knows that we love Mason Jars and has this Regal Bronze Ceiling fan with a nice and simple light kit that looks just inspired in Mason Jars. This ceiling fan has barn wood/dark walnut 52” reversible blades, that looks just distressed and give a weathered appearance. It’s quiet, powerful and overall a good choice for any rustic decorated room. Coziness could be the fundamental characteristic when it comes to decorate following the cabin style guidelines. Think of embracing the rustic surroundings, blending it with the interior design. Lots of exposed wood, rich colors, nature-inspired color schemes and antiques are proper details from this style. Everything must work together to make an comfortable, cozy and inviting environment. 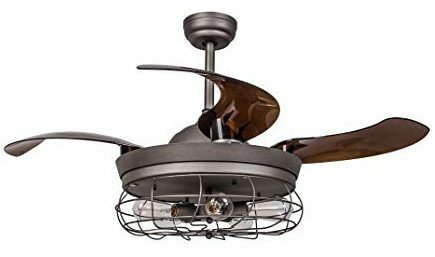 Installing a ceiling fan can be an disruptive element in a cozy-rustic room, unless you find perfect lodge ceiling fans like this Westinghouse 7800000 Brentford ceiling fan. Its 52” blades makes it suitable for rooms up to 360 sq ft. This ceiling fan has 3 speeds and reversible mode, has an airflow of 5062 CFM and an airflow efficiency of 92 CFM/watt. Hunter is a huge ceiling fan manufacturer with a great array of vintage-rustic looking ceiling fan. Impeccable design and high quality, a Hunter ceiling fan would be a great investment. 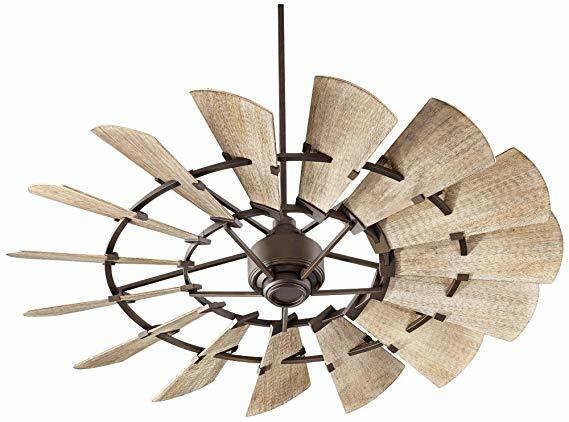 One of the most popular products is the Hunter Fan 54″ Weathered Zinc Outdoor Ceiling Fan. 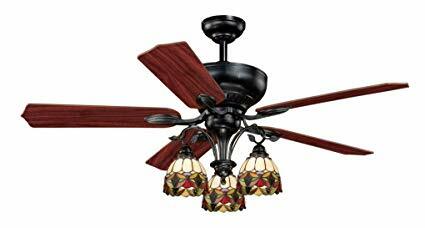 This antique looking ceiling fan has 54” blades, suitable for rooms up to 400 sq ft. It has a weathered zinc finish, 5 reversible gray pine blades, and an integrated light kit made with clear glass that looks just like a lantern. Controlled by remote control, has 3 speeds, reverse motor, an airflow of 3947 CFM and dimmable lights. Can be installed as a rustic outdoor ceiling fans. The Canarm CF52OTT5GPH Otto has 52 inches blades with reversible finishes in walnut and silver oak. Ideal for rooms up to 350 sq ft, this dual mount fan combines the antique looking with rustic- industrial style. The light kit features a cage style that encloses filament bulbs that complements the vintage vibe. It’s an ideal choice for those looking for a bold, industrial and rustic ceiling fan, a piece able to enrich any decoration. Pair it with Edison- vintage bulbs to obtain the best look. 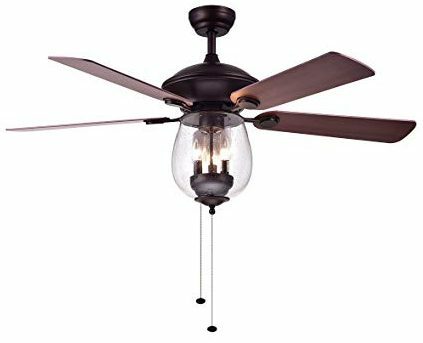 The Stella Mira from Westinghouse is a vintage-industrial ceiling fan with five 52 inches blades, suitable for a room up to 400 sq ft. Blades are reversible, so it’s easier to adapt it to your color scheme. There’s an applewood finish and a catalpa one. But the real protagonist is the LED light kit, encased in a oil rubbed curved structure, designed with industrial-rustic appeal. 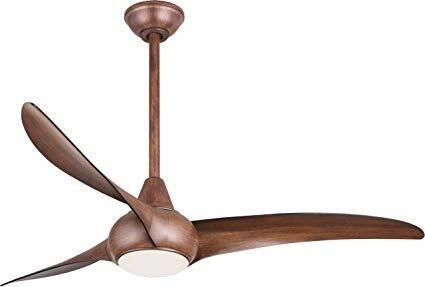 But this ceiling fan has more than a nice look: a good motor that offers 3 speeds, reversible function and an airflow of 5011 CFM and an efficiency of 85 CFM/Watt. Operated with a handheld remote control that will let you choose the speed and dimmer, this ceiling fan got both style and function. Encased lights and fans used to be a safety regulation in those old days: lights were hot, fan blades were made of metal and you need to protect people’s fingers. Nowadays, cages are more an aesthetical decision that takes that functional object back into the past. This industrial 42” ceiling fan has a chandelier cage that gives rustic-industrial-retro vibes, perfect for any rustic inclined decoration. This ceiling fan is a semi flush mount ceiling fan, recommended only for indoor use. Made in quality material, is operated by a handheld remote control. Without doubt, it will be the perfect addition to your industrial-rustic room. 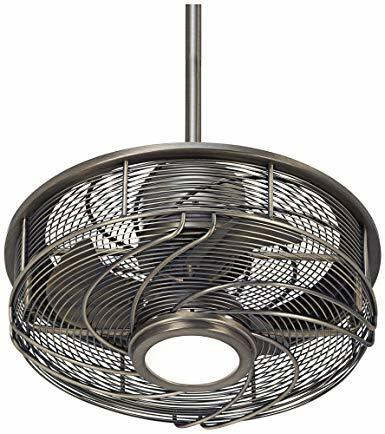 If you are looking for a inconspicuous industrial ceiling fan, then this Parrot Uncle Industrial ceiling fan is the one you need. A nice, industrial-looking caged light kit are the perfect cover for retractable fan blades. 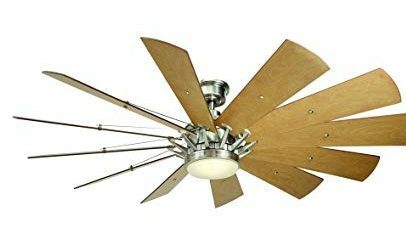 Four acrylic fan blades are designed to fit and retract over the light kit when not in use, you’ll be able to keep that rustic-retro atmosphere while taking advantage of having a ceiling fan in your room. Fan blades are made of ABS acrylic, and have a 42 inches span, ideal for rooms up to 300 sq ft. Those blades extends and retracts automatically when you operate the handheld remote control. It has 3 basic speeds and a button to dimming lights. This ceiling fan doesn’t have a reversible function, so think about it as a summer-only appliance. 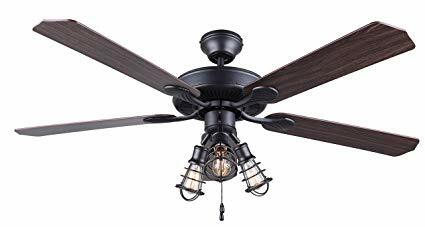 The Quorum 97215-86 Windmill Ceiling Fan will make the difference. Not only because of the stunning country-look, but because of efficiency. Fifteen blades made of weathered oak blades and a powerful motor are the perfect combination to create a great piece that is not only gorgeous but functional. Perfect for high and/or vaulted ceilings, we are sure that the Quorum will be a show-stopper. It’s a 72” fan, suitable for big rooms (up to 400 sq ft), offers 3 speed and is controlled by a wall mount control. Their buyers says that it’s stunning, works flawlessly, it’s really quiet and powerful. Be careful to add a Quorum rod to your rustic ceiling fans Amazon cart, because it isn’t included on the box. And if you want a light kit, you should order it separately. The Trudeau from Home decorator is a 60” windmill ceiling fan suitable for a big room, over 20×20 ft. Take advantage of its DC motor, 70% more efficient, energy saver and powerful than most fan motors. It offers 9 speeds, light timer, light dimmer and reverse function to use it during the coldest months, all controlled by a comfortable handheld remote control. 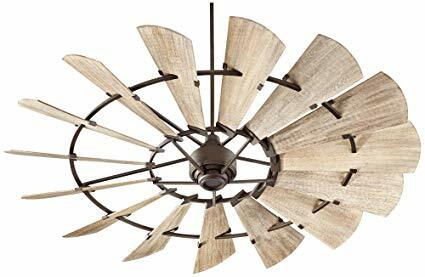 This gorgeous rustic ceiling fans from Amazon has a special feature: the comfort breeze mode, that makes change speeds randomly in order to create a wind-like natural breeze. This huge ceiling fan has a nice nice bronze finish, coupled with wood cherry maple blades and light kit protected with a dome style frosted glass. The result is a sober rustic suitable ceiling fan, incredibly efficient but is also a gorgeous and interesting decorative piece. It could work as a great rustic outdoor ceiling fans. Quorum is specialist in these gorgeous weathered, rustic-looking pieces that transcends the typical concept of a just functional ceiling fan. The Quorum 96015-86 has fifteen nice weathered oak blades, ideal for shabby chic, cabin style or any variation of rustic decor. The oiled bronze finish gives the right amount of sophistication to make a distinguished and eye-catching decorative object. This windmill ceiling fan is 60 inches, making it suitable for medium sized rooms up to 300 sq ft. It’s controlled by a wall control, that’ll let you select any of its 6 speeds and reversible mode. Remember: you’ll need to buy a longer rod and if you need a light kit, you’ll be able to find it online. The Quorum windmill ceiling fan is a stunning signature piece for your rustic rooms. Home Decorators can make really unique fans, that can bring the look and style that you are looking for. Take for instance this gorgeous windmill ceiling fan that is part of their Trudeau Collection. Its blades are 60 inches, suitable for medium sized rooms. 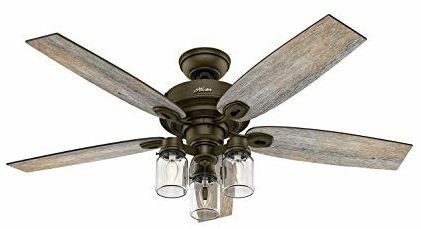 This ceiling fan has a brushed nickel finish and polished wood blades, while its light kit has a dimmable 18-watt LED source. Fully operated by a remote control, has features like 6 speeds, light dimmer and timer, fan reverse function and the exclusive comfort breeze option, that randomizes fan speeds in order to create a natural-feeling relaxing and cooling breeze. It’s the best option for country or rustic decorative styles in high or vaulted ceilings.